We feel sorry for people who discover Life Isn’t Fair. It’s an unpleasant realization, one that’s often accompanied by fist shaking, table pounding and other notable hand gestures. Life is not fair, and we must either accept it, or follow Miriam Hopkins’ lead in the 1943 drama Old Acquaintance, which is to ensure life is more fair to you than to others. Old Acquaintance is what’s called a “women’s picture”, one of several melodramas made by Warner Bros around World War II. This one is about the friendship between two women over the span of 20 years. 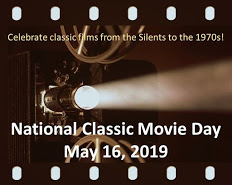 It stars Bette Davis as Kit, a down-to-earth, roll-with-the-punches kind of gal, and Miriam Hopkins as Millie, a vain, tightly-wound, self-centred greedy-pants. The two women could not be more different and it’s almost unfathomable they should become and remain friends. The screenplay acknowledges our disbelief: In one scene Hopkin’s husband (Jon Loder), asks Davis why she’s been life-long friends with Hopkins. Davis replies, “She knew me when everyone called me ‘Chucky’.” This matters to Davis, although we can’t imagine why. We can, however, imagine millions of reasons not to remain friends with Hopkins, the greatest being her infuriating nature. She is so volatile. She’s cheery, then furious, then in tears. You never know what’s coming next. Plus, she chooses to see life as she wants it to be, not as it is. (For example, she dresses in the frilly costumes of her characters in the popular romance novels she writes.) Yet, this approach brings her material success – which is even more maddening. Many have criticized Hopkins for being too over-the top, as though she were playing to a large outdoor theatre rather than studio cameras. Yet, we mustn’t be too dismissive of Hopkins’ performance. It’s her theatrics, for instance, that make Davis look even more even-tempered – the neck-shaking event notwithstanding. It’s also worth nothing that Hopkins maintains a high level of intensity throughout the movie, which deliberately keeps the audience on edge. She’s not telling the truth, of course. The person who matters most in the world, besides herself, is Davis. Hopkins, strangely, almost becomes subservient to Davis’ character. Davis is the only one who can reason with her, calm her down and, ultimately, forgive her. Old Acquaintance is pure melodrama, but it is an interesting look at women’s friendship – a topic Hollywood normally overlooks. As much as Hopkins’ character infuriates us, she has a way of making us exonerate her in the end. 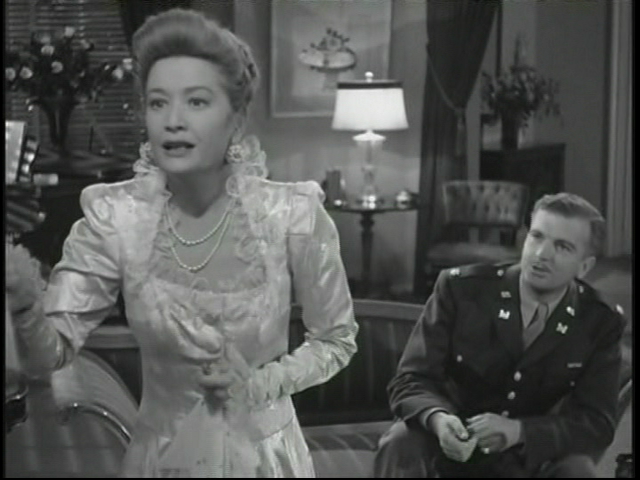 Old Acquaintance: starring Bette Davis, Miriam Hopkins, Gig Young. Directed by Vincent Sherman. Written by John Van Druten and Lenore Coffee. Warner Brothers Pictures, 1943, B&W, 110 mins. 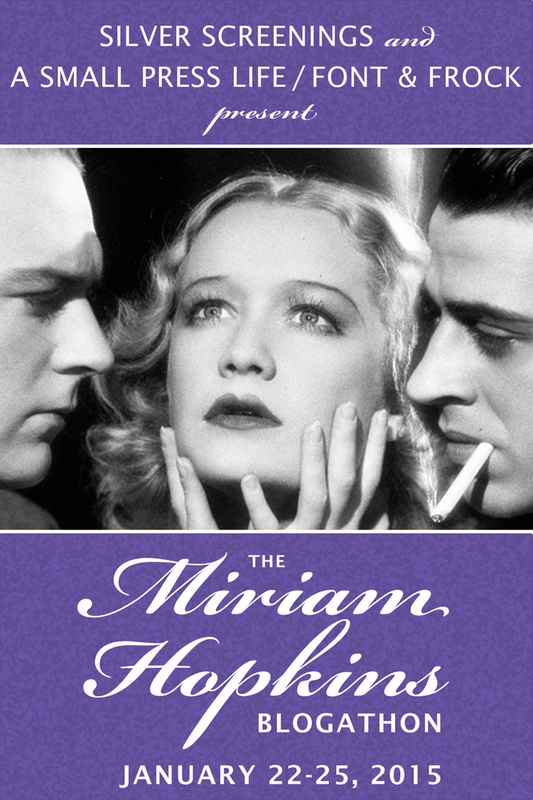 This post is part of the Miriam Hopkins Blogathon, hosted by yours truly and Maedez of A Small Press Life and Font and Frock. Click HERE for a list of all participants. Love your lead! And your take on this movie. I always watch for Miriam’s scene-stealing tricks when she is on screen with Bette Davis. Ha ha! Yes, that Miriam has a million scene-stealing tricks, doesn’t she? A person could almost make a drinking game of it. I recently read one of Whitney Stine’s Bette Davis books, “‘I’d Love to Kiss You…’ Conversations with Bette Davis,” and in it Bette mentions Miriam’s little tricks. It’s been a couple of years since I’ve seen Old Acquaintance but it made me laugh to read that in the book, because I remember noticing Miriam’s excessive fidgeting! Oh, Miriam is a master of those tricks, isn’t she? She knows exactly what she’s doing. But she’s just so much fun to watch! Millie is a true drama queen and anyone who complains that Miriam Hopkins was too over-the-top can probably count themselves fortunate that they don’t have a true drama queen in their lives. Ha! SO TRUE!! We know a drama queen who is EXACTLY like Miriam’s character. However, you know that folks like these never make for a dull day. Ah yes, Jo, you should watch “Old Acquaintance” for some high-strength estrogen, as you put it. Sometimes that’s just what a gal needs. I like Hopkins scenes with Davis. I find them believable as long-time friends…which goes to show that both were terrific actors. It’s years since I saw this one when it came on TV – I really loved it though, partly because it is about women’s friendship, as you say. Really enjoyed your piece, which has brought it all back to me! I find it hard to believe that Davis and Hopkins hated each other in real life, even though I know they did, because they make such a great combination on screen and you can really believe they are the best of friends .. also in ‘The Old Maid’. Despite all the rivalry between them, that’s what I remember best – that the characters were constantly talking to each other about all kinds of things, including writing their books, not just about men as so often in “women’s films”. I’m also interested to see that John Loder was in this – I’ve just seen him in one of his early British films, ‘My Song Goes Round the World’ (I reviewed that one at my new British films blog), and he was very good and so amazingly handsome in that. Anyway, a great contribution to a great blogathon. I know! Isn’t it amazing how believable Bette Davis and Miriam Hopkins are as best friends in this film? When I watch their scenes together, I almost can’t believe there was off-screen animosity. You make a good point re: the characters talking about all kinds of things and not just about men. This film definitely passes the Bechdel test! Thanks, Dor! I really enjoy Hopkins and Davis in their scenes together. They were true professionals, no? Thanks, Dor! I love the Hopkins + Davis scenes. Even though they weren’t pals in real life, they certainly make friendship look convincing on the big screen, don’t they? That’s the sign of true professionals, I guess. I’m so glad you wrote about this for the blogathon! I love your take on this film, and Miriam’s performance in it. Thank you! Thanks so much! I have a real soft spot for this movie, because it is about friendship and forgiveness. I think it’s remarkable how Miriam and Bette D. (of all people) can make us believe their characters are lifelong friends. It’s survival of the fittest right?! I haven’t seen this for a while (generally I’m not a fan of ‘women’s pictures’ 😉 ) and I do remember thinking that Hopkins’ performance was a little… dramatic. But I take your point that it’s that which makes Davis look more rational. Viewing it through a contemporary movie lens though, it’s a refreshing take on female friendship which isn’t a favored topic ‘these days’! Thank you for co-hosting this blogathon, such a wonderful tribute to an under-repped actress! You’re right about Miriam being an under-repped actress. She is a bit excessive at times in this film, but I happen to know someone who is just like her character. Therefore, Bette Davis’ shaking scene is a thoroughly satisfying experience for me. I have not seen this, probably because as you mention it is considered a “women’s picture.” That’s a terrible excuse, I know, but whenever it is on for whatever reason, I just can’t get myself to watch it. Ironically, I did see “Rich and Famous” a remake with Candice Bergen and Jacqueline Bissit. Great review! I still have to see this film, though. I think we probably all have a long time friend that we might not normally be friends with, but circumstances or location brought us together. That helps me make sense of why they are friends in the movie. Your comment about the wringing of the neck above being a satisfying experience made me laugh. Maybe I need to watch this! :) Great post, Ruth! Yes, you’re right, Shari, when you say sometimes we are friends with unlikely people due to circumstances. You might enjoy this film – it really does say a lot about friendship and loyalty. Thanks, Ruth! I will keep an eye out for it.